On 21 April 2009, the Commission adopted a report on the application of Council Regulation (EC) No 44/2001 of 22 December 2000 on jurisdiction and the recognition and enforcement of judgments in civil and commercial matters (3). The report concluded that, in general, the operation of that Regulation is satisfactory, but that it is desirable to improve the application of certain of its provisions, to further facilitate the free circulation of judgments and to further enhance access to justice. Since a number of amendments are to be made to that Regulation it should, in the interests of clarity, be recast. At its meeting in Brussels on 10 and 11 December 2009, the European Council adopted a new multiannual programme entitled ‘The Stockholm Programme – an open and secure Europe serving and protecting citizens’ (4). In the Stockholm Programme the European Council considered that the process of abolishing all intermediate measures (the exequatur) should be continued during the period covered by that Programme. At the same time the abolition of the exequatur should also be accompanied by a series of safeguards. The Union has set itself the objective of maintaining and developing an area of freedom, security and justice, inter alia, by facilitating access to justice, in particular through the principle of mutual recognition of judicial and extra-judicial decisions in civil matters. For the gradual establishment of such an area, the Union is to adopt measures relating to judicial cooperation in civil matters having cross-border implications, particularly when necessary for the proper functioning of the internal market. Certain differences between national rules governing jurisdiction and recognition of judgments hamper the sound operation of the internal market. Provisions to unify the rules of conflict of jurisdiction in civil and commercial matters, and to ensure rapid and simple recognition and enforcement of judgments given in a Member State, are essential. Such provisions fall within the area of judicial cooperation in civil matters within the meaning of Article 81 of the Treaty on the Functioning of the European Union (TFEU). In order to attain the objective of free circulation of judgments in civil and commercial matters, it is necessary and appropriate that the rules governing jurisdiction and the recognition and enforcement of judgments be governed by a legal instrument of the Union which is binding and directly applicable. On 27 September 1968, the then Member States of the European Communities, acting under Article 220, fourth indent, of the Treaty establishing the European Economic Community, concluded the Brussels Convention on Jurisdiction and the Enforcement of Judgments in Civil and Commercial Matters, subsequently amended by conventions on the accession to that Convention of new Member States (5) (‘the 1968 Brussels Convention’). On 16 September 1988, the then Member States of the European Communities and certain EFTA States concluded the Lugano Convention on Jurisdiction and the Enforcement of Judgments in Civil and Commercial Matters (6) (‘the 1988 Lugano Convention’), which is a parallel convention to the 1968 Brussels Convention. The 1988 Lugano Convention became applicable to Poland on 1 February 2000. On 22 December 2000, the Council adopted Regulation (EC) No 44/2001, which replaces the 1968 Brussels Convention with regard to the territories of the Member States covered by the TFEU, as between the Member States except Denmark. By Council Decision 2006/325/EC (7), the Community concluded an agreement with Denmark ensuring the application of the provisions of Regulation (EC) No 44/2001 in Denmark. The 1988 Lugano Convention was revised by the Convention on Jurisdiction and the Recognition and Enforcement of Judgments in Civil and Commercial Matters (8), signed at Lugano on 30 October 2007 by the Community, Denmark, Iceland, Norway and Switzerland (‘the 2007 Lugano Convention’). The 1968 Brussels Convention continues to apply to the territories of the Member States which fall within the territorial scope of that Convention and which are excluded from this Regulation pursuant to Article 355 of the TFEU. The scope of this Regulation should cover all the main civil and commercial matters apart from certain well-defined matters, in particular maintenance obligations, which should be excluded from the scope of this Regulation following the adoption of Council Regulation (EC) No 4/2009 of 18 December 2008 on jurisdiction, applicable law, recognition and enforcement of decisions and cooperation in matters relating to maintenance obligations (9). For the purposes of this Regulation, courts or tribunals of the Member States should include courts or tribunals common to several Member States, such as the Benelux Court of Justice when it exercises jurisdiction on matters falling within the scope of this Regulation. Therefore, judgments given by such courts should be recognised and enforced in accordance with this Regulation. This Regulation should not apply to arbitration. Nothing in this Regulation should prevent the courts of a Member State, when seised of an action in a matter in respect of which the parties have entered into an arbitration agreement, from referring the parties to arbitration, from staying or dismissing the proceedings, or from examining whether the arbitration agreement is null and void, inoperative or incapable of being performed, in accordance with their national law. A ruling given by a court of a Member State as to whether or not an arbitration agreement is null and void, inoperative or incapable of being performed should not be subject to the rules of recognition and enforcement laid down in this Regulation, regardless of whether the court decided on this as a principal issue or as an incidental question. On the other hand, where a court of a Member State, exercising jurisdiction under this Regulation or under national law, has determined that an arbitration agreement is null and void, inoperative or incapable of being performed, this should not preclude that court’s judgment on the substance of the matter from being recognised or, as the case may be, enforced in accordance with this Regulation. This should be without prejudice to the competence of the courts of the Member States to decide on the recognition and enforcement of arbitral awards in accordance with the Convention on the Recognition and Enforcement of Foreign Arbitral Awards, done at New York on 10 June 1958 (‘the 1958 New York Convention’), which takes precedence over this Regulation. This Regulation should not apply to any action or ancillary proceedings relating to, in particular, the establishment of an arbitral tribunal, the powers of arbitrators, the conduct of an arbitration procedure or any other aspects of such a procedure, nor to any action or judgment concerning the annulment, review, appeal, recognition or enforcement of an arbitral award. There must be a connection between proceedings to which this Regulation applies and the territory of the Member States. Accordingly, common rules of jurisdiction should, in principle, apply when the defendant is domiciled in a Member State. A defendant not domiciled in a Member State should in general be subject to the national rules of jurisdiction applicable in the territory of the Member State of the court seised. However, in order to ensure the protection of consumers and employees, to safeguard the jurisdiction of the courts of the Member States in situations where they have exclusive jurisdiction and to respect the autonomy of the parties, certain rules of jurisdiction in this Regulation should apply regardless of the defendant’s domicile. The rules of jurisdiction should be highly predictable and founded on the principle that jurisdiction is generally based on the defendant’s domicile. Jurisdiction should always be available on this ground save in a few well-defined situations in which the subject-matter of the dispute or the autonomy of the parties warrants a different connecting factor. The domicile of a legal person must be defined autonomously so as to make the common rules more transparent and avoid conflicts of jurisdiction. In addition to the defendant’s domicile, there should be alternative grounds of jurisdiction based on a close connection between the court and the action or in order to facilitate the sound administration of justice. The existence of a close connection should ensure legal certainty and avoid the possibility of the defendant being sued in a court of a Member State which he could not reasonably have foreseen. This is important, particularly in disputes concerning non-contractual obligations arising out of violations of privacy and rights relating to personality, including defamation. The owner of a cultural object as defined in Article 1(1) of Council Directive 93/7/EEC of 15 March 1993 on the return of cultural objects unlawfully removed from the territory of a Member State (10) should be able under this Regulation to initiate proceedings as regards a civil claim for the recovery, based on ownership, of such a cultural object in the courts for the place where the cultural object is situated at the time the court is seised. Such proceedings should be without prejudice to proceedings initiated under Directive 93/7/EEC. In relation to insurance, consumer and employment contracts, the weaker party should be protected by rules of jurisdiction more favourable to his interests than the general rules. The autonomy of the parties to a contract, other than an insurance, consumer or employment contract, where only limited autonomy to determine the courts having jurisdiction is allowed, should be respected subject to the exclusive grounds of jurisdiction laid down in this Regulation. Where a question arises as to whether a choice-of-court agreement in favour of a court or the courts of a Member State is null and void as to its substantive validity, that question should be decided in accordance with the law of the Member State of the court or courts designated in the agreement, including the conflict-of-laws rules of that Member State. In the interests of the harmonious administration of justice it is necessary to minimise the possibility of concurrent proceedings and to ensure that irreconcilable judgments will not be given in different Member States. There should be a clear and effective mechanism for resolving cases of lis pendens and related actions, and for obviating problems flowing from national differences as to the determination of the time when a case is regarded as pending. For the purposes of this Regulation, that time should be defined autonomously. However, in order to enhance the effectiveness of exclusive choice-of-court agreements and to avoid abusive litigation tactics, it is necessary to provide for an exception to the general lis pendens rule in order to deal satisfactorily with a particular situation in which concurrent proceedings may arise. This is the situation where a court not designated in an exclusive choice-of-court agreement has been seised of proceedings and the designated court is seised subsequently of proceedings involving the same cause of action and between the same parties. In such a case, the court first seised should be required to stay its proceedings as soon as the designated court has been seised and until such time as the latter court declares that it has no jurisdiction under the exclusive choice-of-court agreement. This is to ensure that, in such a situation, the designated court has priority to decide on the validity of the agreement and on the extent to which the agreement applies to the dispute pending before it. The designated court should be able to proceed irrespective of whether the non-designated court has already decided on the stay of proceedings. This exception should not cover situations where the parties have entered into conflicting exclusive choice-of-court agreements or where a court designated in an exclusive choice-of-court agreement has been seised first. In such cases, the general lis pendens rule of this Regulation should apply. This Regulation should provide for a flexible mechanism allowing the courts of the Member States to take into account proceedings pending before the courts of third States, considering in particular whether a judgment of a third State will be capable of recognition and enforcement in the Member State concerned under the law of that Member State and the proper administration of justice. When taking into account the proper administration of justice, the court of the Member State concerned should assess all the circumstances of the case before it. Such circumstances may include connections between the facts of the case and the parties and the third State concerned, the stage to which the proceedings in the third State have progressed by the time proceedings are initiated in the court of the Member State and whether or not the court of the third State can be expected to give a judgment within a reasonable time. That assessment may also include consideration of the question whether the court of the third State has exclusive jurisdiction in the particular case in circumstances where a court of a Member State would have exclusive jurisdiction. The notion of provisional, including protective, measures should include, for example, protective orders aimed at obtaining information or preserving evidence as referred to in Articles 6 and 7 of Directive 2004/48/EC of the European Parliament and of the Council of 29 April 2004 on the enforcement of intellectual property rights (11). It should not include measures which are not of a protective nature, such as measures ordering the hearing of a witness. This should be without prejudice to the application of Council Regulation (EC) No 1206/2001 of 28 May 2001 on cooperation between the courts of the Member States in the taking of evidence in civil or commercial matters (12). Mutual trust in the administration of justice in the Union justifies the principle that judgments given in a Member State should be recognised in all Member States without the need for any special procedure. In addition, the aim of making cross-border litigation less time-consuming and costly justifies the abolition of the declaration of enforceability prior to enforcement in the Member State addressed. As a result, a judgment given by the courts of a Member State should be treated as if it had been given in the Member State addressed. For the purposes of the free circulation of judgments, a judgment given in a Member State should be recognised and enforced in another Member State even if it is given against a person not domiciled in a Member State. Where a judgment contains a measure or order which is not known in the law of the Member State addressed, that measure or order, including any right indicated therein, should, to the extent possible, be adapted to one which, under the law of that Member State, has equivalent effects attached to it and pursues similar aims. How, and by whom, the adaptation is to be carried out should be determined by each Member State. The direct enforcement in the Member State addressed of a judgment given in another Member State without a declaration of enforceability should not jeopardise respect for the rights of the defence. Therefore, the person against whom enforcement is sought should be able to apply for refusal of the recognition or enforcement of a judgment if he considers one of the grounds for refusal of recognition to be present. This should include the ground that he had not had the opportunity to arrange for his defence where the judgment was given in default of appearance in a civil action linked to criminal proceedings. It should also include the grounds which could be invoked on the basis of an agreement between the Member State addressed and a third State concluded pursuant to Article 59 of the 1968 Brussels Convention. A party challenging the enforcement of a judgment given in another Member State should, to the extent possible and in accordance with the legal system of the Member State addressed, be able to invoke, in the same procedure, in addition to the grounds for refusal provided for in this Regulation, the grounds for refusal available under national law and within the time-limits laid down in that law. The recognition of a judgment should, however, be refused only if one or more of the grounds for refusal provided for in this Regulation are present. Pending a challenge to the enforcement of a judgment, it should be possible for the courts in the Member State addressed, during the entire proceedings relating to such a challenge, including any appeal, to allow the enforcement to proceed subject to a limitation of the enforcement or to the provision of security. In order to inform the person against whom enforcement is sought of the enforcement of a judgment given in another Member State, the certificate established under this Regulation, if necessary accompanied by the judgment, should be served on that person in reasonable time before the first enforcement measure. In this context, the first enforcement measure should mean the first enforcement measure after such service. Where provisional, including protective, measures are ordered by a court having jurisdiction as to the substance of the matter, their free circulation should be ensured under this Regulation. However, provisional, including protective, measures which were ordered by such a court without the defendant being summoned to appear should not be recognised and enforced under this Regulation unless the judgment containing the measure is served on the defendant prior to enforcement. This should not preclude the recognition and enforcement of such measures under national law. Where provisional, including protective, measures are ordered by a court of a Member State not having jurisdiction as to the substance of the matter, the effect of such measures should be confined, under this Regulation, to the territory of that Member State. Continuity between the 1968 Brussels Convention, Regulation (EC) No 44/2001 and this Regulation should be ensured, and transitional provisions should be laid down to that end. The same need for continuity applies as regards the interpretation by the Court of Justice of the European Union of the 1968 Brussels Convention and of the Regulations replacing it. Respect for international commitments entered into by the Member States means that this Regulation should not affect conventions relating to specific matters to which the Member States are parties. Without prejudice to the obligations of the Member States under the Treaties, this Regulation should not affect the application of bilateral conventions and agreements between a third State and a Member State concluded before the date of entry into force of Regulation (EC) No 44/2001 which concern matters governed by this Regulation. In order to ensure that the certificates to be used in connection with the recognition or enforcement of judgments, authentic instruments and court settlements under this Regulation are kept up-to-date, the power to adopt acts in accordance with Article 290 of the TFEU should be delegated to the Commission in respect of amendments to Annexes I and II to this Regulation. It is of particular importance that the Commission carry out appropriate consultations during its preparatory work, including at expert level. The Commission, when preparing and drawing up delegated acts, should ensure a simultaneous, timely and appropriate transmission of relevant documents to the European Parliament and to the Council. This Regulation respects fundamental rights and observes the principles recognised in the Charter of Fundamental Rights of the European Union, in particular the right to an effective remedy and to a fair trial guaranteed in Article 47 of the Charter. Since the objective of this Regulation cannot be sufficiently achieved by the Member States and can be better achieved at Union level, the Union may adopt measures in accordance with the principle of subsidiarity as set out in Article 5 of the Treaty on European Union (TEU). In accordance with the principle of proportionality, as set out in that Article, this Regulation does not go beyond what is necessary in order to achieve that objective. The United Kingdom and Ireland, in accordance with Article 3 of the Protocol on the position of the United Kingdom and Ireland, annexed to the TEU and to the then Treaty establishing the European Community, took part in the adoption and application of Regulation (EC) No 44/2001. In accordance with Article 3 of Protocol No 21 on the position of the United Kingdom and Ireland in respect of the area of freedom, security and justice, annexed to the TEU and to the TFEU, the United Kingdom and Ireland have notified their wish to take part in the adoption and application of this Regulation. 1. This Regulation shall apply in civil and commercial matters whatever the nature of the court or tribunal. It shall not extend, in particular, to revenue, customs or administrative matters or to the liability of the State for acts and omissions in the exercise of State authority (acta iure imperii). wills and succession, including maintenance obligations arising by reason of death. ‘judgment’ means any judgment given by a court or tribunal of a Member State, whatever the judgment may be called, including a decree, order, decision or writ of execution, as well as a decision on the determination of costs or expenses by an officer of the court. ‘court of origin’ means the court which has given the judgment the recognition of which is invoked or the enforcement of which is sought. in Sweden, in summary proceedings concerning orders to pay (betalningsföreläggande) and assistance (handräckning), the Enforcement Authority (Kronofogdemyndigheten). 1. Subject to this Regulation, persons domiciled in a Member State shall, whatever their nationality, be sued in the courts of that Member State. 2. Persons who are not nationals of the Member State in which they are domiciled shall be governed by the rules of jurisdiction applicable to nationals of that Member State. 1. Persons domiciled in a Member State may be sued in the courts of another Member State only by virtue of the rules set out in Sections 2 to 7 of this Chapter. 2. In particular, the rules of national jurisdiction of which the Member States are to notify the Commission pursuant to point (a) of Article 76(1) shall not be applicable as against the persons referred to in paragraph 1. 1. If the defendant is not domiciled in a Member State, the jurisdiction of the courts of each Member State shall, subject to Article 18(1), Article 21(2) and Articles 24 and 25, be determined by the law of that Member State. 2. As against such a defendant, any person domiciled in a Member State may, whatever his nationality, avail himself in that Member State of the rules of jurisdiction there in force, and in particular those of which the Member States are to notify the Commission pursuant to point (a) of Article 76(1), in the same way as nationals of that Member State. provided that this provision shall apply only if it is claimed that the defendant has an interest in the cargo or freight or had such an interest at the time of salvage. in matters relating to a contract, if the action may be combined with an action against the same defendant in matters relating to rights in rem in immovable property, in the court of the Member State in which the property is situated. Where by virtue of this Regulation a court of a Member State has jurisdiction in actions relating to liability from the use or operation of a ship, that court, or any other court substituted for this purpose by the internal law of that Member State, shall also have jurisdiction over claims for limitation of such liability. In matters relating to insurance, jurisdiction shall be determined by this Section, without prejudice to Article 6 and point 5 of Article 7.
if he is a co-insurer, in the courts of a Member State in which proceedings are brought against the leading insurer. 2. An insurer who is not domiciled in a Member State but has a branch, agency or other establishment in one of the Member States shall, in disputes arising out of the operations of the branch, agency or establishment, be deemed to be domiciled in that Member State. In respect of liability insurance or insurance of immovable property, the insurer may in addition be sued in the courts for the place where the harmful event occurred. The same applies if movable and immovable property are covered by the same insurance policy and both are adversely affected by the same contingency. 1. In respect of liability insurance, the insurer may also, if the law of the court permits it, be joined in proceedings which the injured party has brought against the insured. 2. Articles 10, 11 and 12 shall apply to actions brought by the injured party directly against the insurer, where such direct actions are permitted. 3. If the law governing such direct actions provides that the policyholder or the insured may be joined as a party to the action, the same court shall have jurisdiction over them. 1. Without prejudice to Article 13(3), an insurer may bring proceedings only in the courts of the Member State in which the defendant is domiciled, irrespective of whether he is the policyholder, the insured or a beneficiary. 2. The provisions of this Section shall not affect the right to bring a counter-claim in the court in which, in accordance with this Section, the original claim is pending. which relates to a contract of insurance in so far as it covers one or more of the risks set out in Article 16.
notwithstanding points 1 to 4, all ‘large risks’ as defined in Directive 2009/138/EC of the European Parliament and of the Council of 25 November 2009 on the taking-up and pursuit of the business of Insurance and Reinsurance (Solvency II) (14). 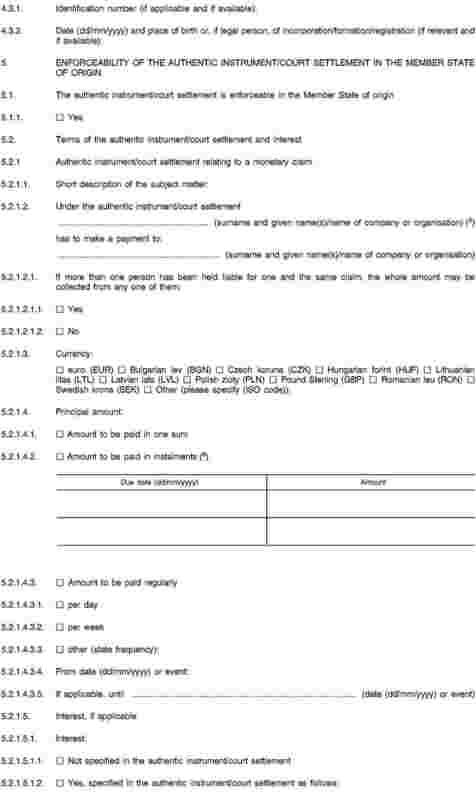 in all other cases, the contract has been concluded with a person who pursues commercial or professional activities in the Member State of the consumer’s domicile or, by any means, directs such activities to that Member State or to several States including that Member State, and the contract falls within the scope of such activities. 2. Where a consumer enters into a contract with a party who is not domiciled in a Member State but has a branch, agency or other establishment in one of the Member States, that party shall, in disputes arising out of the operations of the branch, agency or establishment, be deemed to be domiciled in that Member State. 3. This Section shall not apply to a contract of transport other than a contract which, for an inclusive price, provides for a combination of travel and accommodation. 1. A consumer may bring proceedings against the other party to a contract either in the courts of the Member State in which that party is domiciled or, regardless of the domicile of the other party, in the courts for the place where the consumer is domiciled. 2. Proceedings may be brought against a consumer by the other party to the contract only in the courts of the Member State in which the consumer is domiciled. 3. This Article shall not affect the right to bring a counter-claim in the court in which, in accordance with this Section, the original claim is pending. which is entered into by the consumer and the other party to the contract, both of whom are at the time of conclusion of the contract domiciled or habitually resident in the same Member State, and which confers jurisdiction on the courts of that Member State, provided that such an agreement is not contrary to the law of that Member State. 1. In matters relating to individual contracts of employment, jurisdiction shall be determined by this Section, without prejudice to Article 6, point 5 of Article 7 and, in the case of proceedings brought against an employer, point 1 of Article 8. 2. Where an employee enters into an individual contract of employment with an employer who is not domiciled in a Member State but has a branch, agency or other establishment in one of the Member States, the employer shall, in disputes arising out of the operations of the branch, agency or establishment, be deemed to be domiciled in that Member State. if the employee does not or did not habitually carry out his work in any one country, in the courts for the place where the business which engaged the employee is or was situated. 2. An employer not domiciled in a Member State may be sued in a court of a Member State in accordance with point (b) of paragraph 1. 1. An employer may bring proceedings only in the courts of the Member State in which the employee is domiciled. 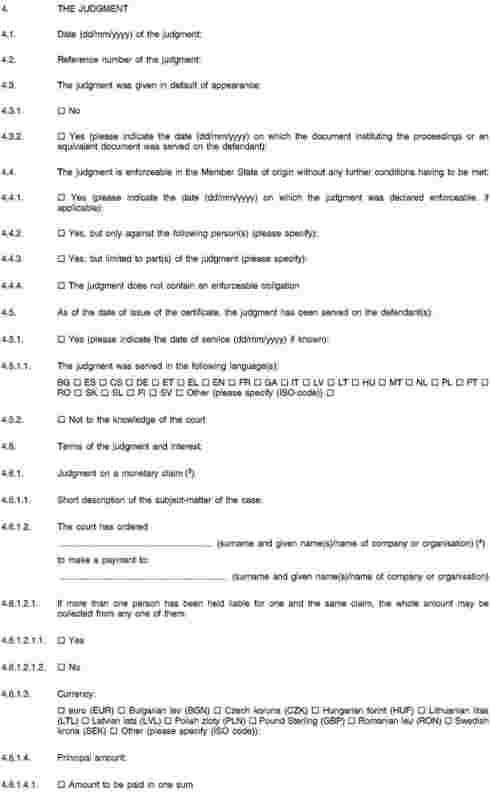 which allows the employee to bring proceedings in courts other than those indicated in this Section. in proceedings which have as their object rights in rem in immovable property or tenancies of immovable property, the courts of the Member State in which the property is situated. 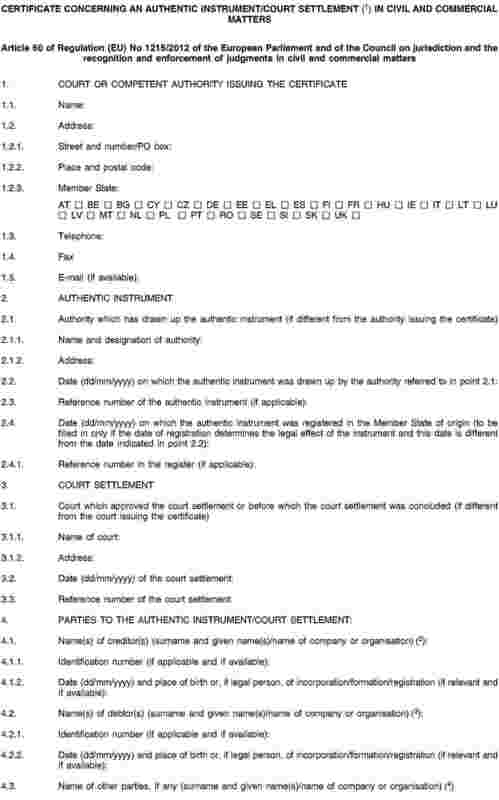 in proceedings concerned with the registration or validity of patents, trade marks, designs, or other similar rights required to be deposited or registered, irrespective of whether the issue is raised by way of an action or as a defence, the courts of the Member State in which the deposit or registration has been applied for, has taken place or is under the terms of an instrument of the Union or an international convention deemed to have taken place. in proceedings concerned with the enforcement of judgments, the courts of the Member State in which the judgment has been or is to be enforced. in international trade or commerce, in a form which accords with a usage of which the parties are or ought to have been aware and which in such trade or commerce is widely known to, and regularly observed by, parties to contracts of the type involved in the particular trade or commerce concerned. 2. Any communication by electronic means which provides a durable record of the agreement shall be equivalent to ‘writing’. 3. The court or courts of a Member State on which a trust instrument has conferred jurisdiction shall have exclusive jurisdiction in any proceedings brought against a settlor, trustee or beneficiary, if relations between those persons or their rights or obligations under the trust are involved. 4. Agreements or provisions of a trust instrument conferring jurisdiction shall have no legal force if they are contrary to Articles 15, 19 or 23, or if the courts whose jurisdiction they purport to exclude have exclusive jurisdiction by virtue of Article 24. 5. An agreement conferring jurisdiction which forms part of a contract shall be treated as an agreement independent of the other terms of the contract. The validity of the agreement conferring jurisdiction cannot be contested solely on the ground that the contract is not valid. 1. Apart from jurisdiction derived from other provisions of this Regulation, a court of a Member State before which a defendant enters an appearance shall have jurisdiction. This rule shall not apply where appearance was entered to contest the jurisdiction, or where another court has exclusive jurisdiction by virtue of Article 24. 2. In matters referred to in Sections 3, 4 or 5 where the policyholder, the insured, a beneficiary of the insurance contract, the injured party, the consumer or the employee is the defendant, the court shall, before assuming jurisdiction under paragraph 1, ensure that the defendant is informed of his right to contest the jurisdiction of the court and of the consequences of entering or not entering an appearance. Where a court of a Member State is seised of a claim which is principally concerned with a matter over which the courts of another Member State have exclusive jurisdiction by virtue of Article 24, it shall declare of its own motion that it has no jurisdiction. 1. Where a defendant domiciled in one Member State is sued in a court of another Member State and does not enter an appearance, the court shall declare of its own motion that it has no jurisdiction unless its jurisdiction is derived from the provisions of this Regulation. 2. The court shall stay the proceedings so long as it is not shown that the defendant has been able to receive the document instituting the proceedings or an equivalent document in sufficient time to enable him to arrange for his defence, or that all necessary steps have been taken to this end. 3. Article 19 of Regulation (EC) No 1393/2007 of the European Parliament and of the Council of 13 November 2007 on the service in the Member States of judicial and extrajudicial documents in civil or commercial matters (service of documents) (15) shall apply instead of paragraph 2 of this Article if the document instituting the proceedings or an equivalent document had to be transmitted from one Member State to another pursuant to that Regulation. 4. Where Regulation (EC) No 1393/2007 is not applicable, Article 15 of the Hague Convention of 15 November 1965 on the Service Abroad of Judicial and Extrajudicial Documents in Civil or Commercial Matters shall apply if the document instituting the proceedings or an equivalent document had to be transmitted abroad pursuant to that Convention. 1. Without prejudice to Article 31(2), where proceedings involving the same cause of action and between the same parties are brought in the courts of different Member States, any court other than the court first seised shall of its own motion stay its proceedings until such time as the jurisdiction of the court first seised is established. 2. In cases referred to in paragraph 1, upon request by a court seised of the dispute, any other court seised shall without delay inform the former court of the date when it was seised in accordance with Article 32. 3. Where the jurisdiction of the court first seised is established, any court other than the court first seised shall decline jurisdiction in favour of that court. 1. Where related actions are pending in the courts of different Member States, any court other than the court first seised may stay its proceedings. 2. Where the action in the court first seised is pending at first instance, any other court may also, on the application of one of the parties, decline jurisdiction if the court first seised has jurisdiction over the actions in question and its law permits the consolidation thereof. 3. For the purposes of this Article, actions are deemed to be related where they are so closely connected that it is expedient to hear and determine them together to avoid the risk of irreconcilable judgments resulting from separate proceedings. 1. Where actions come within the exclusive jurisdiction of several courts, any court other than the court first seised shall decline jurisdiction in favour of that court. 2. Without prejudice to Article 26, where a court of a Member State on which an agreement as referred to in Article 25 confers exclusive jurisdiction is seised, any court of another Member State shall stay the proceedings until such time as the court seised on the basis of the agreement declares that it has no jurisdiction under the agreement. 3. Where the court designated in the agreement has established jurisdiction in accordance with the agreement, any court of another Member State shall decline jurisdiction in favour of that court. 4. 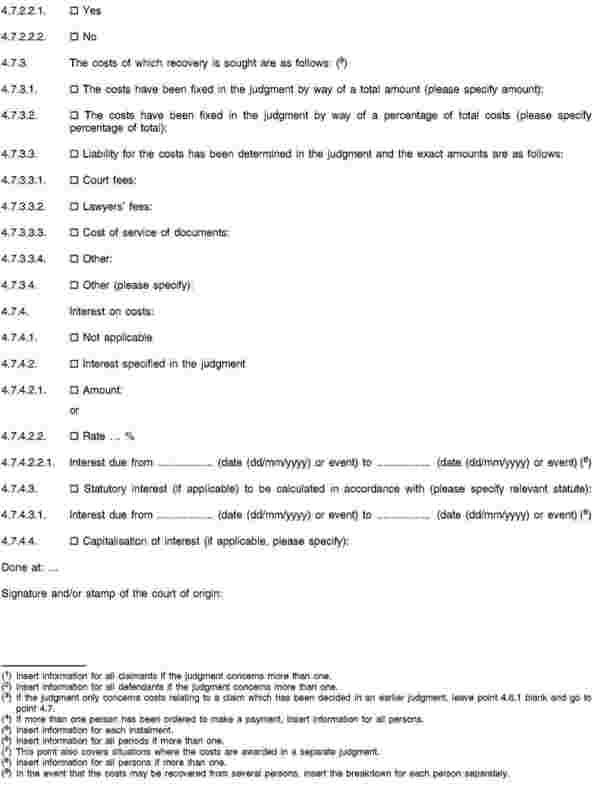 Paragraphs 2 and 3 shall not apply to matters referred to in Sections 3, 4 or 5 where the policyholder, the insured, a beneficiary of the insurance contract, the injured party, the consumer or the employee is the claimant and the agreement is not valid under a provision contained within those Sections. if the document has to be served before being lodged with the court, at the time when it is received by the authority responsible for service, provided that the claimant has not subsequently failed to take the steps he was required to take to have the document lodged with the court. The authority responsible for service referred to in point (b) shall be the first authority receiving the documents to be served. 2. The court, or the authority responsible for service, referred to in paragraph 1, shall note, respectively, the date of the lodging of the document instituting the proceedings or the equivalent document, or the date of receipt of the documents to be served. the court of the Member State is satisfied that a stay is necessary for the proper administration of justice. the continuation of the proceedings is required for the proper administration of justice. 3. The court of the Member State shall dismiss the proceedings if the proceedings in the court of the third State are concluded and have resulted in a judgment capable of recognition and, where applicable, of enforcement in that Member State. 4. The court of the Member State shall apply this Article on the application of one of the parties or, where possible under national law, of its own motion. 3. The court of the Member State may dismiss the proceedings if the proceedings in the court of the third State are concluded and have resulted in a judgment capable of recognition and, where applicable, of enforcement in that Member State. Application may be made to the courts of a Member State for such provisional, including protective, measures as may be available under the law of that Member State, even if the courts of another Member State have jurisdiction as to the substance of the matter. 1. A judgment given in a Member State shall be recognised in the other Member States without any special procedure being required. 2. Any interested party may, in accordance with the procedure provided for in Subsection 2 of Section 3, apply for a decision that there are no grounds for refusal of recognition as referred to in Article 45. 3. If the outcome of proceedings in a court of a Member State depends on the determination of an incidental question of refusal of recognition, that court shall have jurisdiction over that question. the certificate issued pursuant to Article 53. 2. The court or authority before which a judgment given in another Member State is invoked may, where necessary, require the party invoking it to provide, in accordance with Article 57, a translation or a transliteration of the contents of the certificate referred to in point (b) of paragraph 1. The court or authority may require the party to provide a translation of the judgment instead of a translation of the contents of the certificate if it is unable to proceed without such a translation. an application has been submitted for a decision that there are no grounds for refusal of recognition as referred to in Article 45 or for a decision that the recognition is to be refused on the basis of one of those grounds. A judgment given in a Member State which is enforceable in that Member State shall be enforceable in the other Member States without any declaration of enforceability being required. An enforceable judgment shall carry with it by operation of law the power to proceed to any protective measures which exist under the law of the Member State addressed. 1. Subject to the provisions of this Section, the procedure for the enforcement of judgments given in another Member State shall be governed by the law of the Member State addressed. A judgment given in a Member State which is enforceable in the Member State addressed shall be enforced there under the same conditions as a judgment given in the Member State addressed. 2. Notwithstanding paragraph 1, the grounds for refusal or of suspension of enforcement under the law of the Member State addressed shall apply in so far as they are not incompatible with the grounds referred to in Article 45. 3. The party seeking the enforcement of a judgment given in another Member State shall not be required to have a postal address in the Member State addressed. Nor shall that party be required to have an authorised representative in the Member State addressed unless such a representative is mandatory irrespective of the nationality or the domicile of the parties. the certificate issued pursuant to Article 53, certifying that the judgment is enforceable and containing an extract of the judgment as well as, where appropriate, relevant information on the recoverable costs of the proceedings and the calculation of interest. 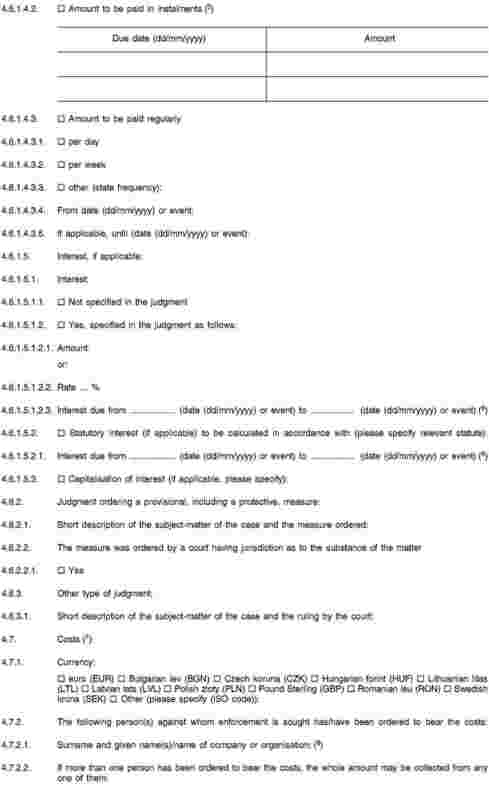 where the measure was ordered without the defendant being summoned to appear, proof of service of the judgment. 3. The competent enforcement authority may, where necessary, require the applicant to provide, in accordance with Article 57, a translation or a transliteration of the contents of the certificate. 4. The competent enforcement authority may require the applicant to provide a translation of the judgment only if it is unable to proceed without such a translation. 1. Where enforcement is sought of a judgment given in another Member State, the certificate issued pursuant to Article 53 shall be served on the person against whom the enforcement is sought prior to the first enforcement measure. The certificate shall be accompanied by the judgment, if not already served on that person. the official language of the Member State in which he is domiciled or, where there are several official languages in that Member State, the official language or one of the official languages of the place where he is domiciled. Where a translation of the judgment is requested under the first subparagraph, no measures of enforcement may be taken other than protective measures until that translation has been provided to the person against whom enforcement is sought. This paragraph shall not apply if the judgment has already been served on the person against whom enforcement is sought in one of the languages referred to in the first subparagraph or is accompanied by a translation into one of those languages. 3. This Article shall not apply to the enforcement of a protective measure in a judgment or where the person seeking enforcement proceeds to protective measures in accordance with Article 40.
suspend, either wholly or in part, the enforcement proceedings. 2. The competent authority in the Member State addressed shall, on the application of the person against whom enforcement is sought, suspend the enforcement proceedings where the enforceability of the judgment is suspended in the Member State of origin. Section 6 of Chapter II. 2. In its examination of the grounds of jurisdiction referred to in point (e) of paragraph 1, the court to which the application was submitted shall be bound by the findings of fact on which the court of origin based its jurisdiction. 3. Without prejudice to point (e) of paragraph 1, the jurisdiction of the court of origin may not be reviewed. The test of public policy referred to in point (a) of paragraph 1 may not be applied to the rules relating to jurisdiction. 4. The application for refusal of recognition shall be made in accordance with the procedures provided for in Subsection 2 and, where appropriate, Section 4. On the application of the person against whom enforcement is sought, the enforcement of a judgment shall be refused where one of the grounds referred to in Article 45 is found to exist. 1. The application for refusal of enforcement shall be submitted to the court which the Member State concerned has communicated to the Commission pursuant to point (a) of Article 75 as the court to which the application is to be submitted. 2. The procedure for refusal of enforcement shall, in so far as it is not covered by this Regulation, be governed by the law of the Member State addressed. 3. The applicant shall provide the court with a copy of the judgment and, where necessary, a translation or transliteration of it. The court may dispense with the production of the documents referred to in the first subparagraph if it already possesses them or if it considers it unreasonable to require the applicant to provide them. In the latter case, the court may require the other party to provide those documents. 4. The party seeking the refusal of enforcement of a judgment given in another Member State shall not be required to have a postal address in the Member State addressed. Nor shall that party be required to have an authorised representative in the Member State addressed unless such a representative is mandatory irrespective of the nationality or the domicile of the parties. The court shall decide on the application for refusal of enforcement without delay. 1. The decision on the application for refusal of enforcement may be appealed against by either party. 2. The appeal is to be lodged with the court which the Member State concerned has communicated to the Commission pursuant to point (b) of Article 75 as the court with which such an appeal is to be lodged. The decision given on the appeal may only be contested by an appeal where the courts with which any further appeal is to be lodged have been communicated by the Member State concerned to the Commission pursuant to point (c) of Article 75. 1. The court to which an application for refusal of enforcement is submitted or the court which hears an appeal lodged under Article 49 or Article 50 may stay the proceedings if an ordinary appeal has been lodged against the judgment in the Member State of origin or if the time for such an appeal has not yet expired. In the latter case, the court may specify the time within which such an appeal is to be lodged. 2. Where the judgment was given in Ireland, Cyprus or the United Kingdom, any form of appeal available in the Member State of origin shall be treated as an ordinary appeal for the purposes of paragraph 1. Under no circumstances may a judgment given in a Member State be reviewed as to its substance in the Member State addressed. The court of origin shall, at the request of any interested party, issue the certificate using the form set out in Annex I. 1. If a judgment contains a measure or an order which is not known in the law of the Member State addressed, that measure or order shall, to the extent possible, be adapted to a measure or an order known in the law of that Member State which has equivalent effects attached to it and which pursues similar aims and interests. Such adaptation shall not result in effects going beyond those provided for in the law of the Member State of origin. 2. Any party may challenge the adaptation of the measure or order before a court. 3. If necessary, the party invoking the judgment or seeking its enforcement may be required to provide a translation or a transliteration of the judgment. A judgment given in a Member State which orders a payment by way of a penalty shall be enforceable in the Member State addressed only if the amount of the payment has been finally determined by the court of origin. 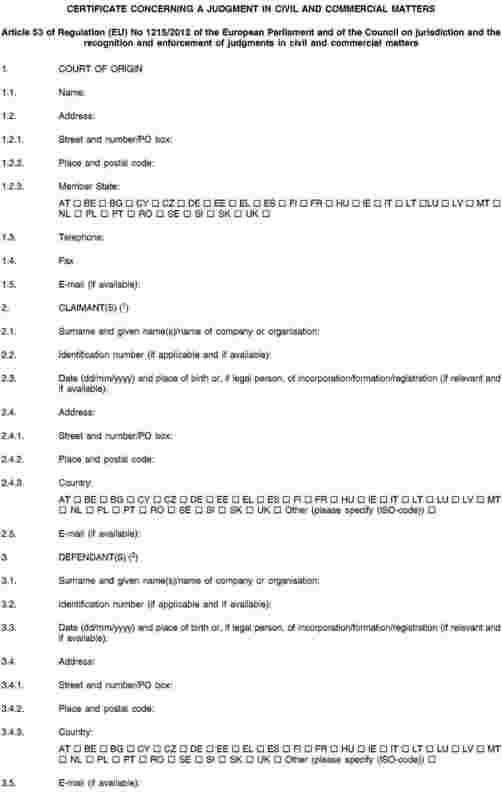 No security, bond or deposit, however described, shall be required of a party who in one Member State applies for the enforcement of a judgment given in another Member State on the ground that he is a foreign national or that he is not domiciled or resident in the Member State addressed. 1. When a translation or a transliteration is required under this Regulation, such translation or transliteration shall be into the official language of the Member State concerned or, where there are several official languages in that Member State, into the official language or one of the official languages of court proceedings of the place where a judgment given in another Member State is invoked or an application is made, in accordance with the law of that Member State. 2. For the purposes of the forms referred to in Articles 53 and 60, translations or transliterations may also be into any other official language or languages of the institutions of the Union that the Member State concerned has indicated it can accept. 3. Any translation made under this Regulation shall be done by a person qualified to do translations in one of the Member States. 1. An authentic instrument which is enforceable in the Member State of origin shall be enforceable in the other Member States without any declaration of enforceability being required. Enforcement of the authentic instrument may be refused only if such enforcement is manifestly contrary to public policy (ordre public) in the Member State addressed. The provisions of Section 2, Subsection 2 of Section 3, and Section 4 of Chapter III shall apply as appropriate to authentic instruments. 2. The authentic instrument produced must satisfy the conditions necessary to establish its authenticity in the Member State of origin. A court settlement which is enforceable in the Member State of origin shall be enforced in the other Member States under the same conditions as authentic instruments. 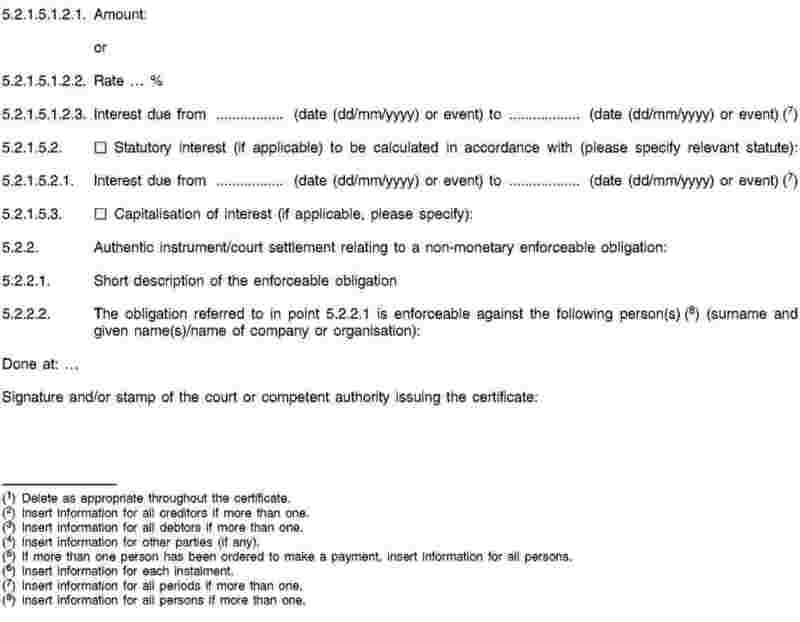 The competent authority or court of the Member State of origin shall, at the request of any interested party, issue the certificate using the form set out in Annex II containing a summary of the enforceable obligation recorded in the authentic instrument or of the agreement between the parties recorded in the court settlement. No legalisation or other similar formality shall be required for documents issued in a Member State in the context of this Regulation. 1. In order to determine whether a party is domiciled in the Member State whose courts are seised of a matter, the court shall apply its internal law. 2. If a party is not domiciled in the Member State whose courts are seised of the matter, then, in order to determine whether the party is domiciled in another Member State, the court shall apply the law of that Member State. 2. For the purposes of Ireland, Cyprus and the United Kingdom, ‘statutory seat’ means the registered office or, where there is no such office anywhere, the place of incorporation or, where there is no such place anywhere, the place under the law of which the formation took place. 3. In order to determine whether a trust is domiciled in the Member State whose courts are seised of the matter, the court shall apply its rules of private international law. Without prejudice to any more favourable provisions of national laws, persons domiciled in a Member State who are being prosecuted in the criminal courts of another Member State of which they are not nationals for an offence which was not intentionally committed may be defended by persons qualified to do so, even if they do not appear in person. However, the court seised of the matter may order appearance in person; in the case of failure to appear, a judgment given in the civil action without the person concerned having had the opportunity to arrange for his defence need not be recognised or enforced in the other Member States. 1. The jurisdiction specified in point 2 of Article 8 and Article 13 in actions on a warranty or guarantee or in any other third-party proceedings may be resorted to in the Member States included in the list established by the Commission pursuant to point (b) of Article 76(1) and Article 76(2) only in so far as permitted under national law. A person domiciled in another Member State may be invited to join the proceedings before the courts of those Member States pursuant to the rules on third-party notice referred to in that list. 2. Judgments given in a Member State by virtue of point 2 of Article 8 or Article 13 shall be recognised and enforced in accordance with Chapter III in any other Member State. Any effects which judgments given in the Member States included in the list referred to in paragraph 1 may have, in accordance with the law of those Member States, on third parties by application of paragraph 1 shall be recognised in all Member States. 3. The Member States included in the list referred to in paragraph 1 shall, within the framework of the European Judicial Network in civil and commercial matters established by Council Decision 2001/470/EC (16) (‘the European Judicial Network’) provide information on how to determine, in accordance with their national law, the effects of the judgments referred to in the second sentence of paragraph 2. 1. This Regulation shall apply only to legal proceedings instituted, to authentic instruments formally drawn up or registered and to court settlements approved or concluded on or after 10 January 2015. 2. Notwithstanding Article 80, Regulation (EC) No 44/2001 shall continue to apply to judgments given in legal proceedings instituted, to authentic instruments formally drawn up or registered and to court settlements approved or concluded before 10 January 2015 which fall within the scope of that Regulation. This Regulation shall not prejudice the application of provisions governing jurisdiction and the recognition and enforcement of judgments in specific matters which are contained in instruments of the Union or in national legislation harmonised pursuant to such instruments. 1. This Regulation shall, as between the Member States, supersede the 1968 Brussels Convention, except as regards the territories of the Member States which fall within the territorial scope of that Convention and which are excluded from this Regulation pursuant to Article 355 of the TFEU. 2. In so far as this Regulation replaces the provisions of the 1968 Brussels Convention between the Member States, any reference to that Convention shall be understood as a reference to this Regulation. Subject to Articles 70 and 71, this Regulation shall, as between the Member States, supersede the conventions that cover the same matters as those to which this Regulation applies. In particular, the conventions included in the list established by the Commission pursuant to point (c) of Article 76(1) and Article 76(2) shall be superseded. 1. The conventions referred to in Article 69 shall continue to have effect in relation to matters to which this Regulation does not apply. 2. They shall continue to have effect in respect of judgments given, authentic instruments formally drawn up or registered and court settlements approved or concluded before the date of entry into force of Regulation (EC) No 44/2001. 1. This Regulation shall not affect any conventions to which the Member States are parties and which, in relation to particular matters, govern jurisdiction or the recognition or enforcement of judgments. judgments given in a Member State by a court in the exercise of jurisdiction provided for in a convention on a particular matter shall be recognised and enforced in the other Member States in accordance with this Regulation. Where a convention on a particular matter to which both the Member State of origin and the Member State addressed are parties lays down conditions for the recognition or enforcement of judgments, those conditions shall apply. In any event, the provisions of this Regulation on recognition and enforcement of judgments may be applied. This Regulation shall not affect agreements by which Member States, prior to the entry into force of Regulation (EC) No 44/2001, undertook pursuant to Article 59 of the 1968 Brussels Convention not to recognise judgments given, in particular in other Contracting States to that Convention, against defendants domiciled or habitually resident in a third State where, in cases provided for in Article 4 of that Convention, the judgment could only be founded on a ground of jurisdiction specified in the second paragraph of Article 3 of that Convention. 1. This Regulation shall not affect the application of the 2007 Lugano Convention. 2. This Regulation shall not affect the application of the 1958 New York Convention. 3. This Regulation shall not affect the application of bilateral conventions and agreements between a third State and a Member State concluded before the date of entry into force of Regulation (EC) No 44/2001 which concern matters governed by this Regulation. The Member States shall provide, within the framework of the European Judicial Network and with a view to making the information available to the public, a description of national rules and procedures concerning enforcement, including authorities competent for enforcement, and information on any limitations on enforcement, in particular debtor protection rules and limitation or prescription periods. The Member States shall keep this information permanently updated. the languages accepted for translations of the forms as referred to in Article 57(2). The Commission shall make the information publicly available through any appropriate means, in particular through the European Judicial Network. the conventions referred to in Article 69. 2. The Commission shall, on the basis of the notifications by the Member States referred to in paragraph 1, establish the corresponding lists. 3. The Member States shall notify the Commission of any subsequent amendments required to be made to those lists. The Commission shall amend those lists accordingly. 4. The Commission shall publish the lists and any subsequent amendments made to them in the Official Journal of the European Union. 5. The Commission shall make all information notified pursuant to paragraphs 1 and 3 publicly available through any other appropriate means, in particular through the European Judicial Network. The Commission shall be empowered to adopt delegated acts in accordance with Article 78 concerning the amendment of Annexes I and II. 2. The power to adopt delegated acts referred to in Article 77 shall be conferred on the Commission for an indeterminate period of time from 9 January 2013. 3. The delegation of power referred to in Article 77 may be revoked at any time by the European Parliament or by the Council. A decision to revoke shall put an end to the delegation of the power specified in that decision. It shall take effect the day following the publication of the decision in the Official Journal of the European Union or at a later date specified therein. It shall not affect the validity of any delegated acts already in force. 5. A delegated act adopted pursuant to Article 77 shall enter into force only if no objection has been expressed either by the European Parliament or the Council within a period of two months of notification of that act to the European Parliament and the Council or if, before the expiry of that period, the European Parliament and the Council have both informed the Commission that they will not object. That period shall be extended by two months at the initiative of the European Parliament or of the Council. By 11 January 2022 the Commission shall present a report to the European Parliament, to the Council and to the European Economic and Social Committee on the application of this Regulation. That report shall include an evaluation of the possible need for a further extension of the rules on jurisdiction to defendants not domiciled in a Member State, taking into account the operation of this Regulation and possible developments at international level. Where appropriate, the report shall be accompanied by a proposal for amendment of this Regulation. This Regulation shall repeal Regulation (EC) No 44/2001. References to the repealed Regulation shall be construed as references to this Regulation and shall be read in accordance with the correlation table set out in Annex III. It shall apply from 10 January 2015, with the exception of Articles 75 and 76, which shall apply from 10 January 2014. Done at Strasbourg, 12 December 2012. (1) OJ C 218, 23.7.2011, p. 78. (2) Position of the European Parliament of 20 November 2012 (not yet published in the Official Journal) and decision of the Council of 6 December 2012. (3) OJ L 12, 16.1.2001, p. 1. (4) OJ C 115, 4.5.2010, p. 1. (5) OJ L 299, 31.12.1972, p. 32, OJ L 304, 30.10.1978, p. 1, OJ L 388, 31.12.1982, p. 1, OJ L 285, 3.10.1989, p. 1, OJ C 15, 15.1.1997, p. 1. For a consolidated text, see OJ C 27, 26.1.1998, p. 1. (6) OJ L 319, 25.11.1988, p. 9. (7) OJ L 120, 5.5.2006, p. 22. (8) OJ L 147, 10.6.2009, p. 5. (9) OJ L 7, 10.1.2009, p. 1. (10) OJ L 74, 27.3.1993, p. 74. (11) OJ L 157, 30.4.2004, p. 45. (12) OJ L 174, 27.6.2001, p. 1. (13) OJ L 299, 16.11.2005, p. 62. (14) OJ L 335, 17.12.2009, p. 1. (15) OJ L 324, 10.12.2007, p. 79. (16) OJ L 174, 27.6.2001, p. 25.